I recently got my grubby hands on a pair of the new Chrome Truk Pro‘s to try out. Much like the Kursk Pro’s these are designed to be a comfortable all day everyday cycle shoe. They are bulkier than the Kursk’s and the pre bent sole and grippy sole is perfect for use in all conditions. I have only been using these for a month though in that time I have managed to put them through a whole load of abuse. Chrome have been leading the way in trainer style cycle shoes for some time now and the Truk is a welcome addition to their already wicked range. They come with a removable plate so you can fit the classic two bolt cleat which is countersunk soyour cleats don’t touch the floor when walking. They are just at home in toe clips or FGFS straps. One of my favorite things about the Truk is that you can run and walk in them as much as you like,unlike most other cycling shoes. Up until recently you only really had two choices of cycling shoe, you could choose between proper road shoes or mountain bike shoes. Chrome have given us a third option, a shoe that you can wear all day whether you are a messenger or just using them to commute in. Chrome have used their wealth of experience in designing functional products to fill the cycling shoe void. The combination of the laces and stiff sole keep them firmly in place and the design means you don’t have to feel like you are wearing some kind of Sci Fi shoe. I usually ride to work in my road shoes then change into my trainers, it wasn’t until I’d been a work for a few hours that I realised I was still wearing the Truks and hadn’t even thought about needing to take them off. I spent years working as a messenger in London an wish that something like this would of been available then. The only option we had then was to cut and shut a pair of trainers and cycle shoes to make a trainer style cycle shoe. 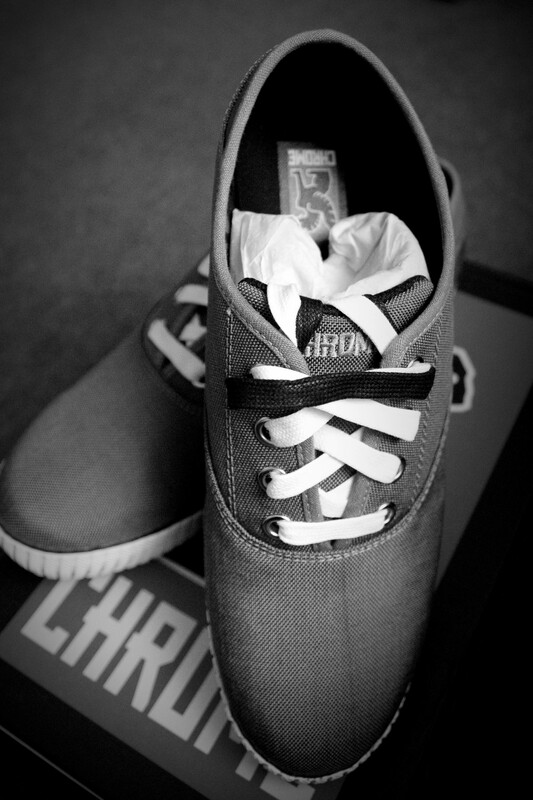 Chrome have knocked the ball out the park with their shoe range. Not only do the look and perform great they are also extremely reasonably priced. If you are interested in getting some new cycle shoes these are definitely a pair I would recommend, my Kursk Pro’s are still going strong after a few years so I have the same high expectations of the Truks. A very well designed, built and affordable shoe! 10 out of 10!